At Fakuma 2018, system partners Engel, ACH-Solution and Dow Silicones will be presenting, for the first time in Europe, an integrated solution for cost-effective production of LED lenses with a highly demanding geometry. At the Dow Silicones (Wiesbaden, Germany) stand (hall B2, stand B2-2220), lenses for LED headlamps will be produced on a tie-bar-less Engel e-victory 310/120 injection moulding machine, with an integrated Engel viper 40 linear robot, in a two-cavity cold runner mould by ACH-Solution (Fischlham, Austria). According to the companies, the lenses are representative of a wide range of applications. Apart from the automotive industry, LSR is becoming increasingly important for building and street lighting. The reason for this are the material characteristics: highly transparent grades for optical applications have a lower yellowing index than conventional thermoplastic lens materials. They are very resistant to environmental influences such as UV radiation and can be used over a wide temperature range from –40 °C to 200 °C. In addition, they allow particularly flexible design. Dowsil MS-1002 Moldable Silicone will be processed at the trade show – it creates smooth and very hard surfaces much like thermoplastics. The headlamp lenses, with their filigree structure, are moulded with highest reproducibility. The lenses leaving the production cell are ready for installation. The production of LED lenses places high demands on the processing technology – not only by the complex part geometry. 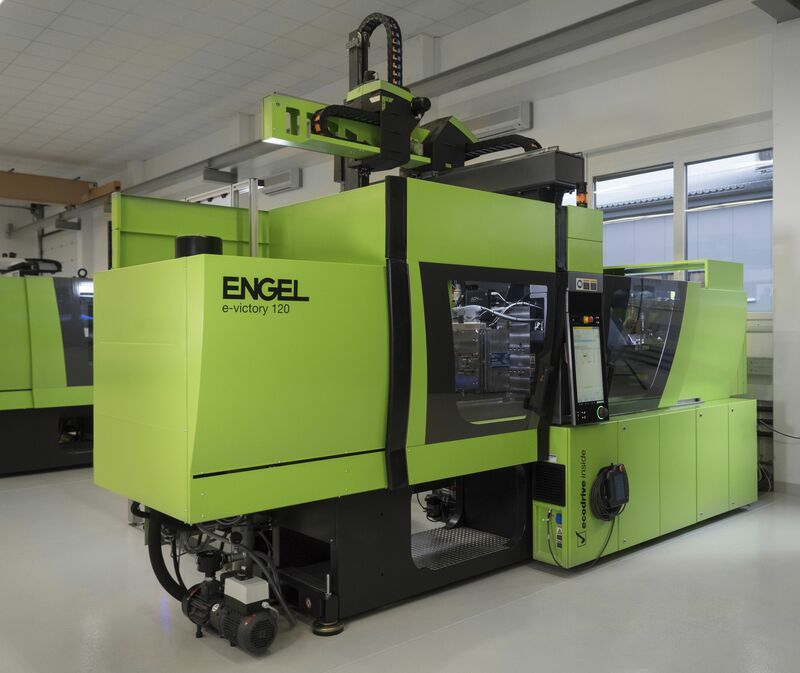 In general, to be profitable in the production of high-tech products made of LSR, the process must be automated and the product must be rework-free, said Engel. Injection moulding machines with tie-bar-less clamping units already provide the optimum design for this, said the company. Free access to the mould area enables efficient automation concepts and compact production cells. Since the mould mounting platens can be fully utilised right up to the edge, the high-volume lens mould fits on a comparatively small 120 t injection moulding machine. One of the reasons for the tie-bar-less e-victory's accurate reproduction of surface detail is the parallelism of the mould mounting platens. The patented force divider ensures that the moving platen follows the mould precisely while clamping force is building up and that the force is evenly distributed across the platen face. When multi-cavity moulds are used, all cavities within the parting line experience the same surface pressure, which prevents flash even when processing very low-viscosity silicones. To guarantee the required precision during injection, the machine is equipped with an electric injection unit. In addition, iQ weight control improves process stability. This intelligent assistance system from Engel's inject 4.0 product programme is able to detect fluctuations in the ambient conditions and raw material, and to compensate for them automatically during the shot. The electric valve gates in the mould are also automatically self-regulating. The Servoshot system by ACH-Solution makes it possible to control each electric valve gate individually. 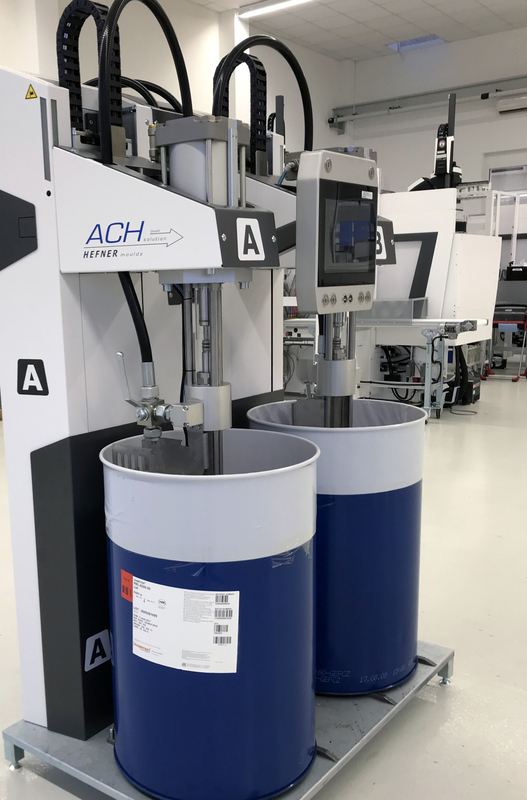 Engel integrates all of the production cell components with the injection moulding machine's CC300 control unit – the entire process, including the MaxiMix G2 type LSR metering equipment by ACH-Solution, can therefore be set up and controlled in an uncomplicated way. The control integration reduces complexity and enhances ease of use. Visitors at Fakuma can be guided through the work steps required to start the production cell with AR (Augmented Reality) glasses from AVR Tech Innovations (Fischlham, Austria). In the form of texts, animated objects or short video sequences, the glasses display helpful additional information on system operations, describing what needs to be done where and how.